Hello, I just replaced components of my A/C system except evaporator. When took vehicle in for evacuate and recharge. He told me I had a leak on compressor hose assembly;(which there after i put o ring on fittings). There was also a leak around evaporator to accumulator. I still think I have a problem here. There was not a o ring on side of accumulator from evaporator when original accumulator was removed. When I put in some can Freon. I can hear air for few seconds after i take off can like it is coming out. The screw nut that is on tube off inlet of evaporator that goes into accumulator did not have o ring. It took awhile to get off and I had to lubricate it with WD40. Now is slides a little back and forth. Is this normal for a evaporator inlet screw nut on tube that goes into accumulator? Thanks in advance. Aways, always there is an o-ring - never is there a metal to metal seal in mobile a/c. Your old o-ring (OEM) was there- it just got sucked in to accumulator after system was evacuated-- been there, done that! Oh BTW your hose assembly uses sealing washers at compressors-- if you put o-rings in there, get them out! That Jimmy (S/T -vehicle uses slimline sealing washers- not the standard ones. A snug fitg is usual- no wiggle or wobble-- you're lucky to get that apart-- galvanic corrosion has shown its ugly head-- That is why I don't change accumulators- if system has not been opened. The compressor, accumulator, and hose assembly are new. Hose assembly have black o rings on them already so i used them along with metal rubber o rings on compressor because it cost of $150 before without use them. Firestone told me I have a leak in that area and at evaporator to accumulator area. Thanks. The metal rubber o rings in pic I have included is what was used for compressor along with rubber green o ring on evaporator to accumulator. I appreciate if you let me know if they work or can you send me in right direction for right o rings seals. Thanks. P.S. 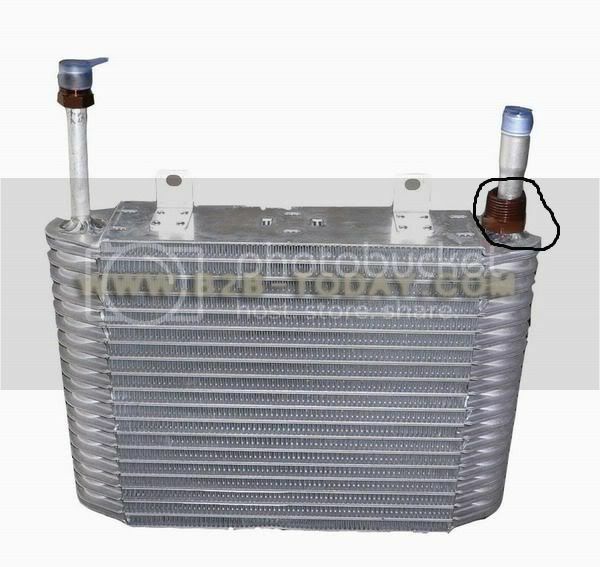 picture of silver evaporator is goggled picture and not minds. I used it to illustrate screw area movement when i took off accumulator and want to find out if that was normal since minds does same thing. 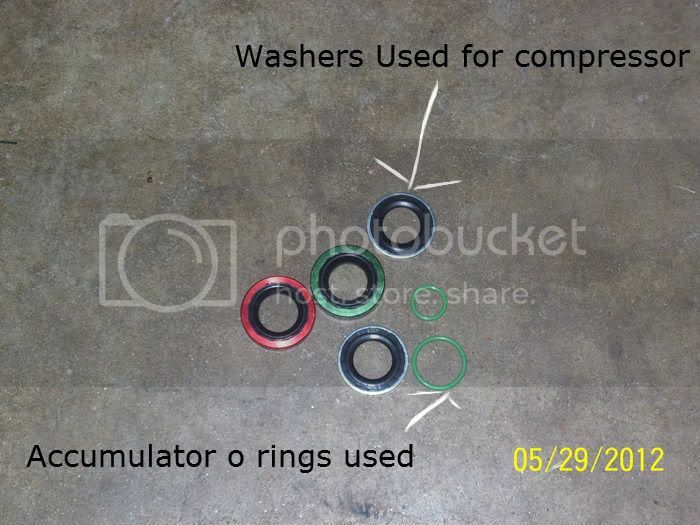 So the metal washers with rubber in middle in picture is what is used for compressor. If so, that is what i put on there. As for evaporator, I put green o ring on tube of evaporator but not in accumulator opening or does that matter? I believe i still have a leak around evaporate into accumulator. I did not use mineral oil. Is there a certain type of mineral oil or just mineral oil. Thus compressor hose assembly had black o rings already on them am I suppose to add green ones too? There is no refrigerant now. I had just recently put on gauge and vacuum to take out moisture. I notice that low port rose slightly above zero after the vac. 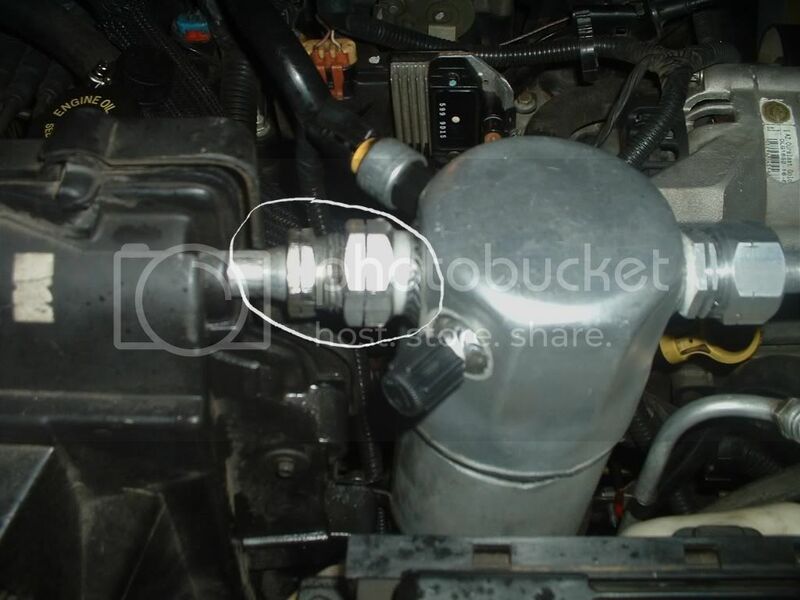 So likely that is a leak right? Vacuum should hold steady at -29 after you close both manifold wheels and (optionally) turn the pump off. If the gauge moves up toward zero there is a leak. What GM Tech said above is that if the nut is not all the way tight, the o-ring can get sucked off the end of the tube and into the accumulator, so it then appears there was no o-ring when you take it apart. I will go back and check my connection and put mineral oil on o ring. Is mineral oil compatible with pag oil that may be on o ring?